This one’s driven me crazy! My challenge had been deciding how to digitize a publication from 1929 so that others can easily read it. Isn’t as simple as it sounds! You can view larger versions of any image in this post by clicking on the image — once enlarged clicking on the image zooms it in closer. 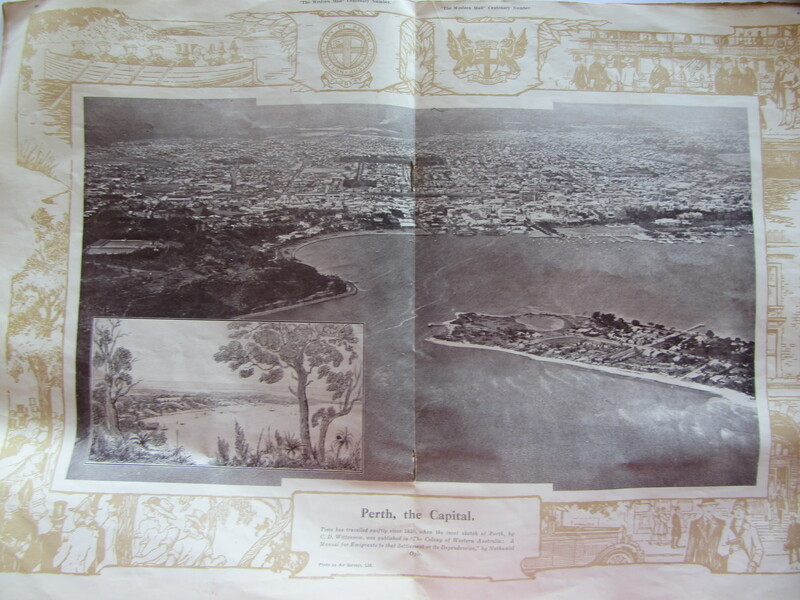 I have a copy of “The Western Mail” Centenary Number publication which was published in July, 1929 to commemorate the 100 years of the founding of Perth and the establishment of the Swan River Colony, the first permanent European settlement in Western Australia. Below are some sample pages from the publication! You can view larger versions of these images by clicking on the image — once enlarged clicking on the image zooms closer. Photographic representation of how train travel developed from page 31. 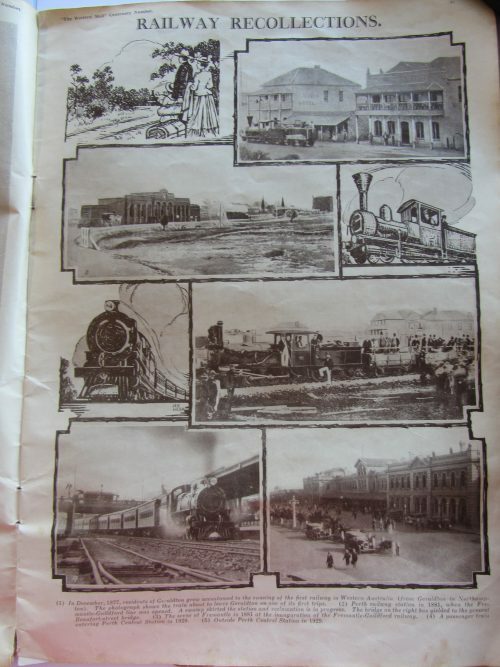 Rail transport was important during 1828 to 1929. You could ask students to share their thoughts of the following photo of the artist’s vision of what the future might look like in 2029 from page 39 of the Western Mail Centenary Number publication. Perth in 2029. Click on the image to view the larger version of the image. Size , shape and number of planes as well as a helicopter looking plane. Narrows bridge – built opened 1959. Perth, 1929. Click on image to view larger version of image. Advertisements could also be used for class discussions. 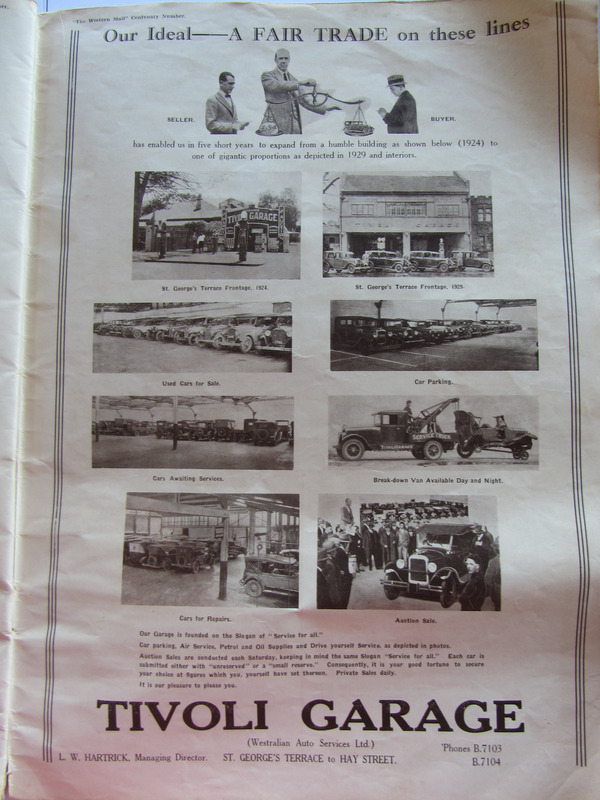 A 1929 advertisement for cars from page 37. I’ve uploaded my copy of the “The Western Mail” Centenary Number publication to a shared Google Photo. Click on the image or link below to view my copy on Google Photos. 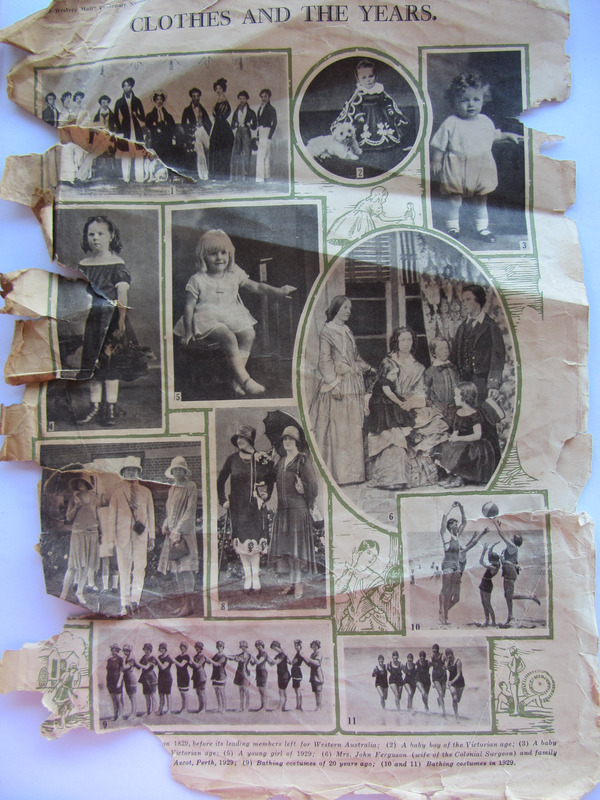 My mother inherited two copies of the publication from my grandparents (or great grandparents). Her complete publication was stolen when she lent it to a friend for an event. The copy I photographed is missing some pages from the front and back (pages 1-8 and pages 71 to 80). You also find “The Western Mail” Centenary Number publication on Trove. Below is a summary of what I considered when sharing the publication for those facing similar challenges. My key priority is to share the publication so others to easily read it. The text in the article is fairly small. The sharing option needs to include the ability for readers to easily zoom into read text and photos closer. Can create a Flickr slideshow that can be embedded into a post. Readers can flip through slideshow directly in a post or page. Zooming functionality requires readers to view the photos directly on Flickr. Flickr has advertisements on slideshows of free users. Change to Flickr ownership could impact Flickr usage. Upload photos to blog All images hosted on my site which enables readers to view them directly on my blog. Zooming functionality harder to set up and isn’t as good as Google Photos or Flickr. Easy to create a shared album and can add text within the album to provide context to the photos. Very easy for readers to zoom in on any photo using any device. Isn’t possible to embed a Google Photos Album or Google Photos Slideshow directly in another website. Can embed a card using Embed Code Generator or link to a shared album. All photos uploaded to this post have been set up so when you click on the image you view the larger version of the image and when you click on the enlarged version you can zoom into the image. I’ve achieved it using the Lightbox for Images plugin with script for zooming the image once it loads with in the lightbox added using the Advanced Settings plugin. Test how zooming works on the following photo by clicking on it! Once loaded in the lightbox you’ll see a zoom icon when you hover your mouse over the image. Holding the left mouse after zooming allows you to drag the image to view specific parts. Leave a comment below if you have other ideas of how I could have shared the publication or if you have any other questions. This post was written in response to Give it Away Now! – #EdublogsClub Prompt 14. Wow, Sue, I wouldn’t have known there were so many ways to share. I love the table showing the pros and cons of each of the ways to share the images. I like that one can check them out too, and see which one we like better. Nice work on a topic that is meaningful to you too, and that others can use. 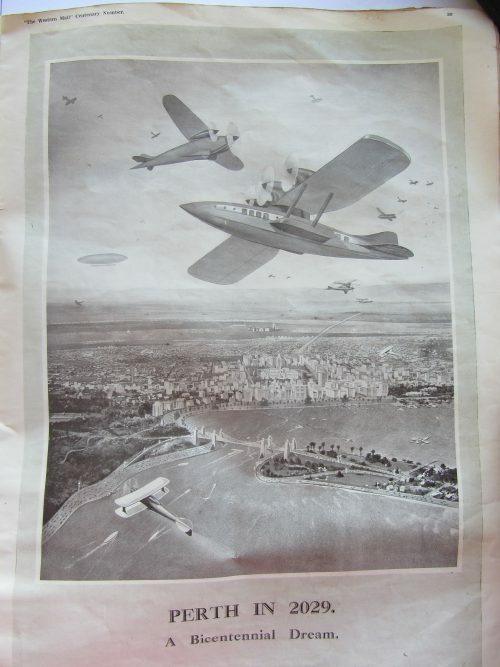 I especially like the artist’s thoughts about what Perth might be like in 2029, which is coming right up! What a treasure trove of learning opportunities! I personally found this interesting as I lived in Perth some years ago and recognised some of the landscapes along with the changes.